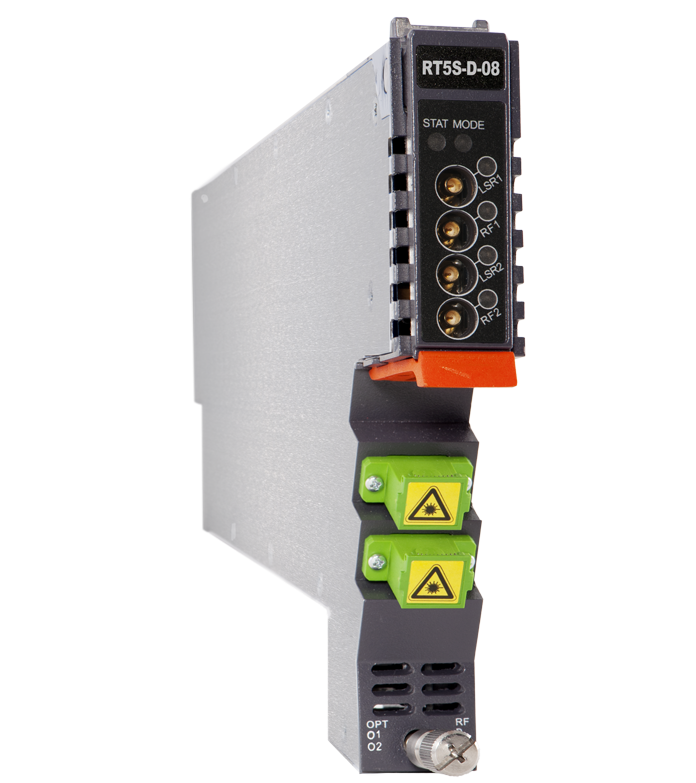 The RT5S, 1550 nm Return Transmitter - Standard series, is a high-density module with two lasers. It is designed to plug into PBN’s latest Advanced Intelligent Multi-services Access platform - the AIMA3000. PBN’s RT5S is currently available in either a dual transmitter configuration. It features a full-spectrum advanced return path transmitter designed for multi-services operators (MSOs) to increase network capacity to satisfy an ever-growing subscriber demand for bandwidth. 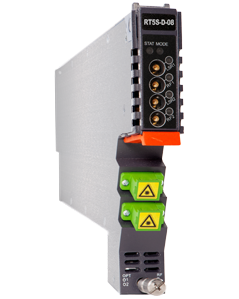 The module’s operating wavelength conforms to ITU standards and it can work with PBN’s Erbium Doped Fiber Amplifier Module (EDFA). It provides the utmost flexibility for MSOs during the transition to all-digital. The RT5S employs an advanced RF circuit design and two high quality independent low-chirp lasers. In addition, it has a cutting-edge optoelectronic design for the delivery of high-quality transmissions, over passive fiber optic networks. 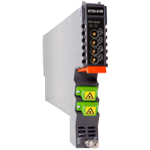 All RT5S models can also be conveniently monitored and controlled through a computer connected to one of the Ethernet ports via the ASMM module. All module settings are retained in non-volatile memory to ensure trouble-free operation. Bulk updating, automatic uploading and downloading of configuration files can be done when using PBN’s NMSE web-based management system. (2) Four mini-SMB connectors on front panel: 2 RF inputs test ports and 2 to measure RF input before the laser. ​(3) Measured in a typical system with 4 channels signal source (11.5 MHz, 26.5 MHz, 45.5 MHz and 58.5 MHz), -2 dBm, 6 % OMI, 10 km fiber. IMD2 is measured at 15 MHz and 38 MHz.